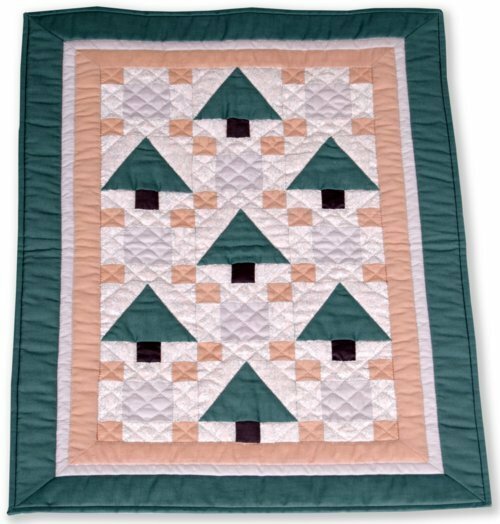 Small quilted wall hanging featuring pieced cedar trees alternating with Nine Patch squares. Three strips of solid fabrics form the borders. Dark green binding. Backing of pink sprigged fabric. Hand-quilted and machine-stitched. This small quilted wall hanging was made by Arlene Anderson and auctioned off on Apr. 30, 1988 for the benefit of the Kansas Quilt Project (KQP). Founded in 1986, the KQP's mission was to collect quilt histories and establish a repository for the resulting data at the Kansas Historical Society. The donor/quilter was married to John Anderson, Jr., Governor of Kansas from 1961-1965. The Andersons were the first governor's family to occupy the executive residence known as Cedar Crest, so named because of its location on the crest of a hill overlooking the cedar-lined Kansas River valley.